Ludwig Stumpfegger (11 July 1910 – c. 2 May 1945) was a German doctor who served in the SS of Nazi Germany during World War II. He was Adolf Hitler's personal surgeon from 1944. Stumpfegger was present in the Führerbunker in Berlin in late April 1945. Stumpfegger was born in Munich in Bavaria. He studied medicine from 1930 onwards. Stumpfegger joined the SS on 2 June 1933 and the Nazi Party on 1 May 1935. He initially worked as an assistant doctor under Professor Karl Gebhardt in the Hohenlychen Sanatorium, which specialised in sports accidents. As a result of this experience, he was part of the medical team, along with Gebhardt, at the 1936 Summer Olympics in Berlin and the Winter Olympics of the same year in Garmisch-Partenkirchen. In August 1937 Stumpfegger obtained his doctor's degree. After World War II began in Europe, the "Hohenlychen" was used by the SS as part of the war effort. Working under the supervision of Gebhardt, Dr. Fritz Fischer and Dr. Herta Oberheuser, he participated in medical experiments, the subjects of which were women from the concentration camp at Ravensbrück. On 1 November 1939, transferred to the surgical department of the SS hospital in Berlin. He was transferred back to the "Hohenlychen" as adjutant to Gebhardt in March 1940. On 20 April 1943, he was promoted to SS-Obersturmbannführer. Upon Himmler's recommendation, he was transferred to "Wolfsschanze" Führer headquarters as the resident doctor on 9 October 1944. In 1945, Stumpfegger started working directly for Hitler in the Führerbunker in Berlin under the direction of Dr. Theodor Morell. At Hitler's request, he provided a cyanide capsule for Blondi, the German Shepherd dog which was a past gift from Martin Bormann, to see how quickly and effectively it worked. As the Red Army advanced towards the bunker complex, some sources report that he helped Magda Goebbels kill her children as they slept in the Vorbunker, before she and her husband Joseph Goebbels committed suicide. On 30 April 1945, just before committing suicide, Hitler signed the order to allow a breakout. 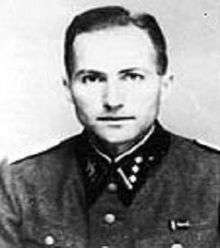 On 1 May, Stumpfegger left Führerbunker in a breakout group that included Martin Bormann, Werner Naumann and Hitler Youth leader Artur Axmann. They were one of ten groups attempting to break out of the Soviet encirclement. At the Weidendammer Bridge, a Tiger tank spearheaded the first attempt by the Germans to storm across the bridge, but it was destroyed. Bormann and Stumpfegger were "knocked over" when the tank was hit. On the third attempt, made around 01:00, Stumpfegger and his group from the Reich Chancellery crossed the Spree. Leaving the rest of their group, Bormann, Stumpfegger, and Axmann walked along railroad tracks to Lehrter station, where Axmann decided to go alone in the opposite direction of his two companions. When he encountered a Red Army patrol, Axmann doubled back. He saw two bodies, which he later identified as Bormann and Stumpfegger, on a bridge near the railway switching yard; the moonlight clearly illuminating their faces. He did not have time to check the bodies, so he did not know what killed them. In 1963, a retired postal worker named Albert Krumnow told police that around 8 May 1945 the Soviets had ordered him and his colleagues to bury two bodies found near the railway bridge near Lehrter station. One was dressed in a Wehrmacht uniform and the other was clad only in his underwear. Krumnow's colleague Wagenpfohl found an SS doctor's paybook on the second body identifying him as Dr. Ludwig Stumpfegger. He gave the paybook to his boss, postal chief Berndt, who turned it over to the Soviets. They in turn destroyed it. He wrote to Stumpfegger's wife on 14 August 1945 and told her that her husband's body was "... interred with the bodies of several other dead soldiers in the grounds of the Alpendorf in Berlin NW 40, Invalidenstrasse 63." Excavations on 20–21 July 1965 at the site specified by Axmann and Krumnow failed to locate the bodies. However, on 7 December 1972, construction workers uncovered human remains near Lehrter station in West Berlin just 12 m (39 ft) from the spot where Krumnow claimed he had buried them. Upon autopsy, fragments of glass found in the jawbones of both skeletons led to the conclusion that they had committed suicide by biting cyanide capsules to avoid capture. Dental records, reconstructed from memory in 1945 by Dr. Hugo Blaschke, along with forensic examiners determined that the size of the skeleton and shape of the skull were identical to Bormann's. Likewise, the second skeleton was deemed to be Stumpfegger's, since it was of similar height to his last known proportions. Composite photographs, where images of the skulls were overlaid on photographs of the two men's faces, were completely congruent. Facial reconstruction was undertaken in early 1973 on both skulls to confirm the identities of the bodies of Stumpfegger and Bormann. Any lingering doubt as to Bormann's identity was removed when confirmed by DNA testing in 1999. Ludwig Stumpfegger has been portrayed by the following actors in film and television productions. Erwin Felgenhauer in the 1971 Eastern Bloc co-production Liberation: The Final Assault. John Barron in the 1973 British film Hitler: The Last Ten Days. Peter Blythe in the 1973 British television production The Death of Adolf Hitler. Thorsten Krohn in the 2004 German film Downfall (Der Untergang). 1 2 Joachimsthaler 1999, p. 290. ↑ Beevor 2002, pp. 380-382. 1 2 3 Beevor 2002, pp. 382–383. 1 2 Le Tissier 2010, p. 188. ↑ Trevor-Roper 1992, p. 245. ↑ Beevor 2002, p. 383. ↑ Lang 1979, p. 417. ↑ Whiting 1996, p. 200. ↑ Whiting 1996, pp. 136–137. ↑ Lang 1979, pp. 421–422. 1 2 3 Whiting 1996, pp. 217–218. 1 2 3 Lang 1979, p. 432. ↑ Lang 1979, p. 436. ↑ Miller 2006, p. 154. ↑ "Hitler: The Last Ten Days (1973)". IMDb.com. Retrieved May 8, 2008. ↑ "The Death of Adolf Hitler (1973) (TV)". IMDb.com. Retrieved May 8, 2008. ↑ "Untergang, Der (2004)". IMDb.com. Retrieved May 8, 2008. Sweeting, C. G. Hitler's Personal Pilot - The Life and Times of Hans Baur. ISBN 1-57488-288-0. Trevor-Roper, Hugh (1992) . The Last Days of Hitler. University Of Chicago Press. ISBN 0-226-81224-3. Whiting, Charles (1996) . The Hunt for Martin Bormann: The Truth. London: Pen & Sword. ISBN 0-85052-527-6.